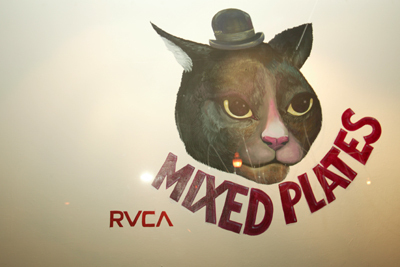 RVCA’s “Mixed Plates” adorn our cupboards and decorate our walls, some loved collected years ago and some new found treasures. 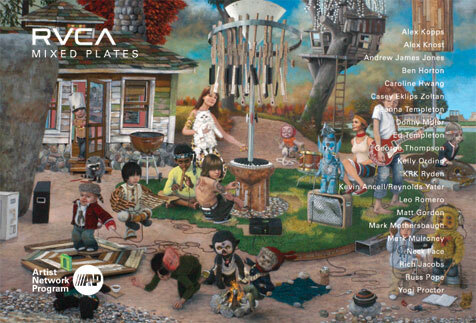 When stacked together, each artist complements the other to create this special group showing. 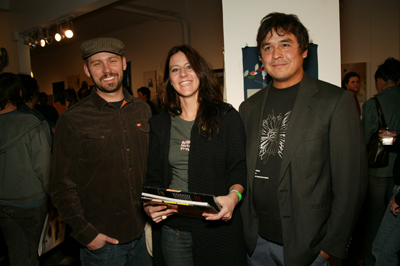 Many of the artists in this show have participated in RVCA and its Artist Network Program, which is an ongoing program for RVCA to show case the talents of established artists as well as unknown artists who inspire and influence our generation. 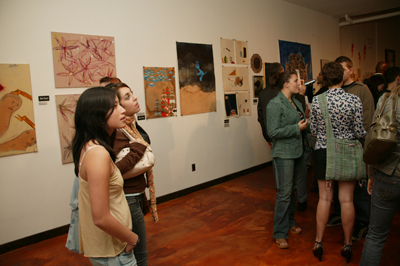 Mark Mulroney describes his art showcased at the VOICE 1156 gallery for the January 2006 show as "several drawings about martyrs, myths and the geographical locations of divine intervention." ARTIST STATEMENT: "I was born in Akron Ohio in 1976. Both my mother and father loved me and I have no reason to doubt that they still do. I have several siblings and some of them have youngsters of their own. I shave regularly and try to follow FDA guidelines for fiber intake." ARTIST BIO: Here is a list of places where my work has appeared: Mixed Greens Gallery (New York), the dumpster outside my apartment building (San Francisco), The San Diego Museum of Contemporary Art, Richard Heller Gallery (Santa Monica), my nephew’s night stand (Eugene, Oregon) and Gregory Lind Gallery (San Francisco). Caroline Hwang was born in Minneapolis, Minnesota when she eventually moved at the ripe age of one to sunny, Southern California for the warmth. She received her Bachelor's Degree at Art Center College of Design. She currently resides in Brooklyn, New York where she paints, stitches, prints and dreams of the day she can bring her dogs to live with her. 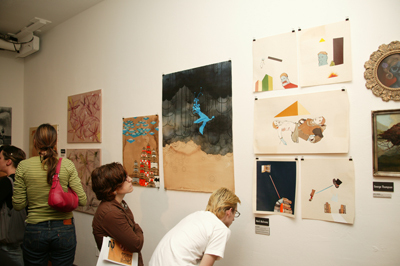 Caroline's work is influenced by crafts, graphic arts, quilting, films, music, among other things. Her work has become what it is today from the days of watching her grandmother crochet and knit. She collages together fabric, thread, and paint to create images that communicate raw human emotion, self reflection, and the dynamics and difficulty of all relationships. She enjoys making dinner for her friends and sharing baked goods with just about anyone. Kelly Ording's art is a combination of coffee, ink & acrylic paint on paper. ARTIST STATEMENT: “My work is concerned with opposites, dichotomies; and how, when placed together, each can make the other stronger visually. I often combine the look of antique with modern, the uncontrollable with the deliberate, and mathematical design with an organic form. I am engrossed with the act of painting, the alchemy of the materials and the evolution of a piece through process." George R. Thompson's art consists of 3 Paintings-- acrylic on masonite. 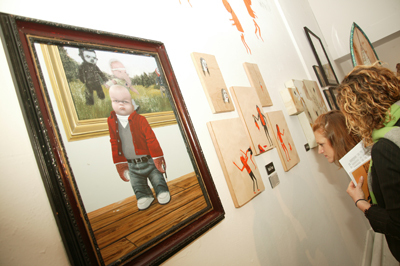 KRK Ryden's art is a record of mongrel pop culture. His aesthetic is informed by comic books, punk rock, and cartoons, while his world view is strictly DEVO. 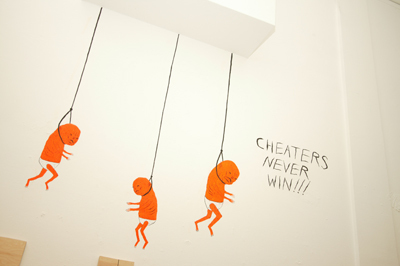 KRK's work embraces everyday absurdity and a cartoony view of reality. His paintings are colorful and visually appealing reflections on discarded icons, and his graphics are well-realized snapshots of cartoon life. For over thirty years KRK has been creating illustrations and paintings for underground bands, publishers, and institutions. I have been drawing all my life and painting for about ten years. Lately I've been using acrylics, house paints, stain, spray paint and pencil on paper, wood and canvas. I live in East County, with my wife, two sons, three cats, one dog and a fish. Rich Jacobs was born in Southern California in 1972 and is now based out of Brooklyn, NY. His paintings, murals and installations have been exhibited internationally as well as printed in various books and magazines. Jacobs has also lent his design to fashion and skateboarding, creating everything from board graphics to parkas and shoes. 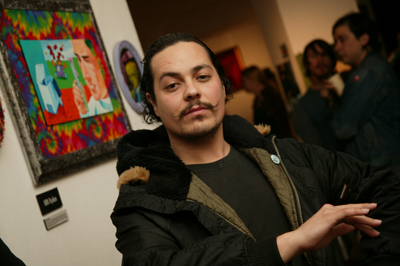 He has done record covers and music related graphics, posters, flyers, and zines. 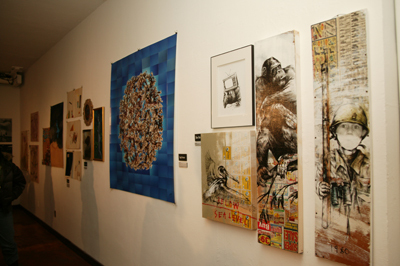 When not making art he spends his free time curating large group art shows under the "Move" moniker. He makes music and listens to it even more frequently. Jacobs feels lucky and grateful for the opportunity to do what he likes. Jacobs reflects on his interest in building relationships between abstraction and figurative styles of art-making and am hoping to create a dialogue within each as he combines both elements in his personal work. 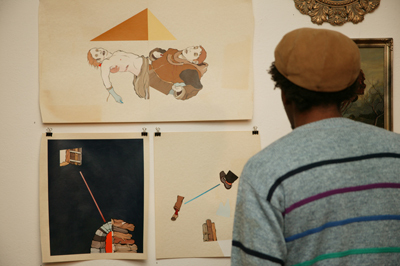 Skateboarding and art have continued to sustain Russ's drive to create. During his college years, he ran SMA Skateboards and started Creature Skateboards, and after a three year stint at Black Label, Russ has recently taken a job as DuFFS VP of Marketing. In 1995, Russ moved to San Luis Obispo and started Scarecrow Skateboards. The pieces Russ created during these years show transition from a more controlled, symmetrical painting style to a looser style expressing motion and music. Russ has shown in: San Luis Obispo, Santa Cruz, Los Angeles, Portland, Washington DC, Miami, , San Francisco, Chicago, New York, and London. 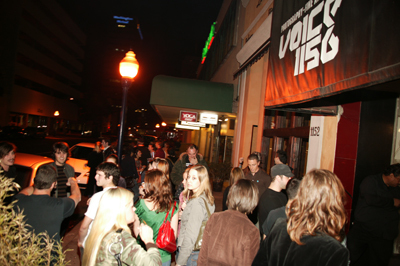 Russ's shows for 2006 will include Paris, Los Angeles, London, and Edinburgh. David Choe was born1976, in Los Angeles. He is currently homeless,making good art and bad music. As an art dropout, he stll gets asked to speak at universties all the time. He can paint anything and everything . he heas won a lot of awards, andhis work can be found from comics, murals, toys,prints, magazine, books, etc.Part of his goals are to retire early, illustraste the entire bible, and paint the entire Great Wall of China. All of my "work" is seen through a self-placed filter formed by my experiences. This statement can be said by any person. The town I live in, Huntington Beach, is a hotbed of right-wing conservatives, skinheads, and religious fervor as well as being a beach community filled with surfers and skaters and all attendant props. The book "teenage smokers" is my first book, aside from making many 'zines. It is a collection of photographs and Polaroids of teenagers smoking. I am now 27 years old and as a professional skateboarder my access to the teen world is quite fluid. I took these photos all over the world, most of the kids are 14 years old, some younger and some older. It amazes me the way they act with cigarettes. The way they dress and hold themselves hits me in some way. I hope the images hit you the same way. I purposely left out text so the viewer can form his own opinions about the collection. I personally do not smoke, and I feel sorry for the kids sometimes, although its probably just a phase. But the ones who get hooked... My last solo show, "The Golden Age of Neglect" at the Alleged gallery was a personal revelation to me. It was the first time I really joined my painting and photography together. 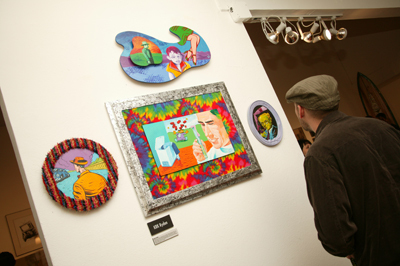 In the show I had one wall dedicated to Teen Smokers, and the remaining 3 walls were blanketed with over 200 paintings and photographs hung on a backing of paper. The paper was there to fulfill the idea that it should be a massive sketchbook you are looking at, instead of an "art show." I am currently working on a written book of stories from childhood, that film maker Mike Mills is interested in for a possible film. He made a short documentary film with me entitled Deformer in 1995. Deformer is the word I use to describe someone's life experiences. Matt Gordon describes his art as "a brief moment of simplicity." Gordon is a self-taught artist. Yogi Proctor describes his art as a Cholla movement. ARTIST STATEMENT: "My art deals with the transformation of form, frameworks and perception through a process of applied movement." ARTIST BIO:	"I am currently studying at The School of The Art Institute of Chicago. My work has been shown in various locations around the globe. 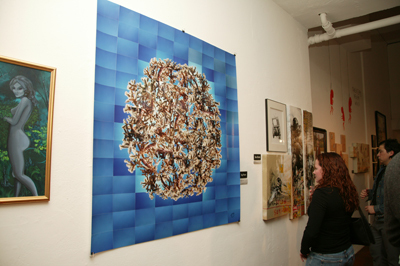 Most recent individual show at Chicago’s Gallery LG, entitled Destiny vs Destiny, from November 17th to December 19th, 2005." Leo Romero describes his photography as a dream series. ARTIST STATEMENT: I shoot what happens in my life. ARTIST BIO:	Born in East LA, now presently living in little Ethiopia. 19 years old. Andrew James Jones' art is LIMITED EDITION ARCHIVAL PRINTS – on Lysonic Paper – Ltd. 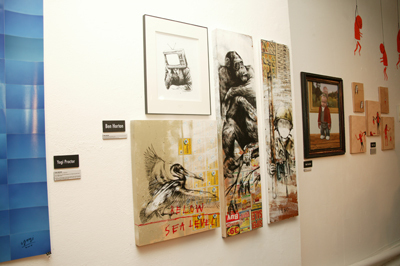 Edition of only 2 prints available for sale at RVCA. 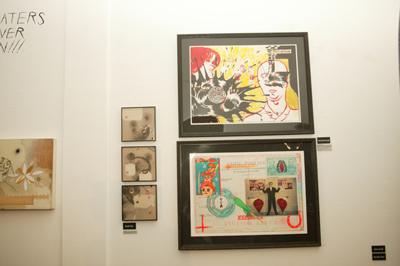 The first batch of Andrew James Jones' Prints ever to be displayed in the USA. ARTIST STATEMENT: "About 2 years ago I saw four crows on a park bench,one was dead and the others were standing round it drinking heavily, when I asked them what they were doing they squawked at me aggressively and one even did a spit which hit me on the hand. Sometimes I think if had just acted differently that day then maybe dad would still be alive." Jones was born in North Wales in 1977. He now lives and works in London, England. NECK Face is a difficult guy to track down. It isn't easy to locate an artist who doesn't give his real name, wears a mask during performances to disguise his identity and moves cities according to the seasons. Yet, everyone in New York City is talking about him. For the past three years, like so many graffiti artists before him, Neck Face has built his reputation by using the street as his canvas. And now, still only 21, he's experiencing the kind of commercial success that could only be frustrating for those artists who lack his DIY initiative and skill for self-promotion. In a city where making a name can take many painstaking years, Neck Face has bypassed the usual channels and managed his own meteoric rise. Neck Face started writing his tag when he was 17 and living what he describes as a regular life with his parents in a small town in Northern California. He won't say which town exactly: he's worried people might figure out who he is and anonymity, it seems, is critical to his success. There was no hip-hop tag, no political message. Neck Face was simple, incessant, and perversely funny. If you live in New York City you may still not understand the reference, but you certainly would have noticed it. He claims to spend a lot of time skateboarding and listening to heavy metal music and says he's never had a job. "I hope I'll never have to get one," he adds. It's difficult to work out whether Neck Face's shtick is an example of his genius or just a clever marketing ploy. Mark's love of art started early in his childhood, just after it was discovered that he was extremely nearsighted and legally blind. His first correctional glasses offered Mark a new view of the world, inspiring his obsession with imagery and illustrations. His first works, which he began creating in the late 60's and into the 70's, consisted of many different mediums, including rubber stamp designs, ink illustrations, screen printing, decals, and mail art. 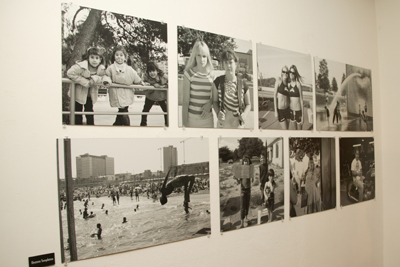 He participated in local showings, and received recognition for his work in his hometown of Akron, Ohio. It all changed for Mark when he decided to share his postcard works in his critically acclaimed solo shows during the 80's & 90's, and with his gallery tour in 2003 titled HOMEFRONT INVASION!. 2005's tour, The Visual Art Of Mark Mothersbaugh, features new works from both his Postcard Diary Prints and Beautiful Mutants photographs. ARTIST STATEMENT:	"I’m tired of paintings, pictures and art that says nothing. So much of art now a day is a pretty picture or whatever and it’s kind of useless. Like a pop song, it sounds all right and everyone likes it because it affords a quick escape from whatever is in front of whoever is listening to it. Wait a minute, you asked me for this artist statement so I would sound like one of those people I hate and I do. You have succeeded. I sound so full of myself, but then that’s what art is. Art is this: 'Look at what I think.'" ARTIST BIO:	"I’ve worked for Etnies, Vans Shoes and some other people, but those are the biggest ones. I’ve worked for really, really cool companies as well. You know, like the cool one’s everyone wants to work for. It’s cool working for those companies. You go in there and you hang out and smoke cigarettes and listen to cool, unusual music and hot people walk by and say irreverent things all day. I’ve had shows in LA, NY, Japan, England and Canada. I saved Canada for last, because I’m weird."